Initially we booked an airbnb for 10 days near the MAYA shopping mall (pronounced may-ah) and Chiang Mai old town. We used this time to find a house. If you’re planning to visit Chiang Mai, I’d definitely recommend this area – it’s loads of fun. The shopping centre itself is great. My favourite shop is ‘Moshi Moshi’. Full of quirky, fun, well designed housewares at Thai prices – you can’t really go wrong. You can get your bubble tea or mango with sticky rice fix at the food court in the basement. There’s also a great vegetarian Thai place with shitake mushrooms to die for. It’s only 40 baht (just under £1/$1.20usd) for rice + 2 dishes. MAYA contains several children’s areas (see image above). 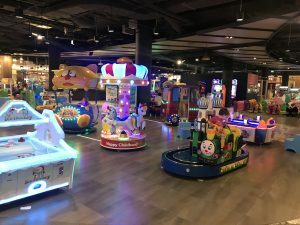 There’s a soft play area on the 2nd floor for 150 baht per child/30 baht per adult. (£3 per child/75p per adult). Outside the centre there are two markets – one right next to MAYA and one just down the street. These are full of things to eat, crafts and beautifully designed clothes, bags and other material items. 2) There’s a lot of traffic and you’ll be waiting at red lights for a long time (I timed one at 6.5 minutes). Use taxis, not Tuk Tuks or Songtheaws to avoid being stuck in a traffic jam in an open air vehicle. 3) This area of Chiang Mai is definitely for night owls. The shopping mall only opens at 11am! We decided pretty quickly that as fun as this area is, it wasn’t suitable for families. 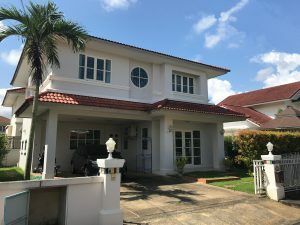 We started looking for a house, and limited our search to the districts surrounding Chiang Mai centre like Hang Dong and San Sai, where there air’s a bit cleaner and you can get a house for the price of a flat in the centre. 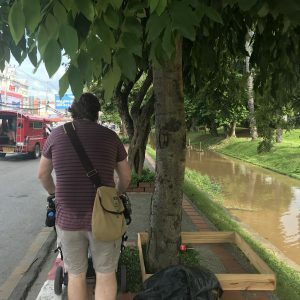 You can read about what it was like searching for somewhere to live in Chiang Mai here. We’ve found a house in a district called ‘San Sai’ about 1/2 hour drive from the centre. 3 bed, 3 bathroom, detatched, in a ‘gated community’. Gated communities are new, well maintained little villages with fences around and 24/7 security. Ours has a playground, basketball hoop, jacuzzi, pool, gym, badminton and tennis courts. The roads are wide with barely any cars as it’s only local traffic and lined with good pavements (hurray), palm trees and a little stream. It’s quite idyllic. We pay 25,000 baht per month for it (around £570/$750 USD). After growing up in a 1 bedroom flat, Jack (our 2 1/2 year old) is thoroughly enjoying having lots of space, his own bedroom and a garden to play in. Our landlady is great. She found us a nanny for the boys (the same one as her previous tenants). Our requests have been dealt with quickly and diligently – there’s a Gazebo in the garden which she’s agreed to fix a couple of broken boards on and repaint. She even removed all the rose bushes that were in the garden and planted flowers instead because she was worried about Jack hurting himself on them! 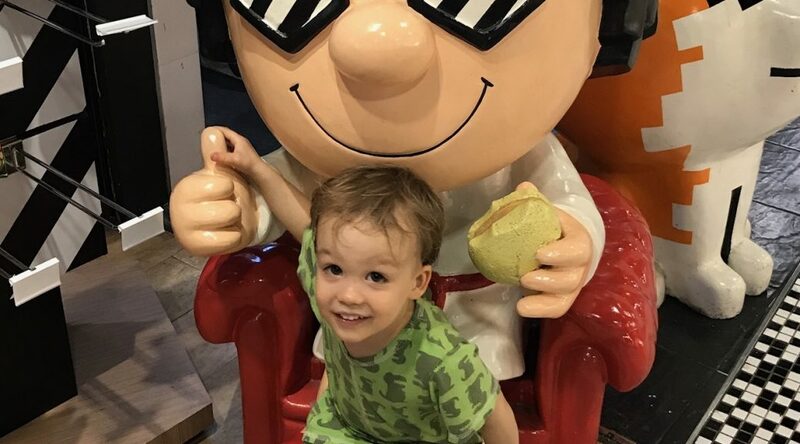 We’ve found a good baby and child shop – I.S. Baby shop, which is well stocked with everything you could want for baby and child. It’s outside of the centre, less busy than some of the other shopping malls and has parking. We’ve found essentials like car seats and boosters. Also some non-essentials like the play dough Sushi making set. 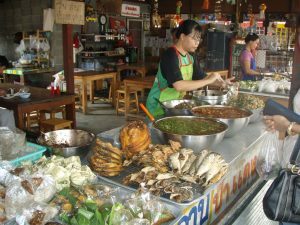 As most people know, markets tend to be the cheapest place to shop in Thailand. There are small local markets everywhere, as well as people going round with bikes selling a few items of fruit (we had one lady selling bunches of bananas come to our door yesterday). The many large markets in Chiang Mai tend to be well stocked, but also busy. JJ market is a good one. It’s on on Saturdays and Sundays and has lots of Organic and pesticide free produce. It has a wholesale Organic section. Arrive when the market opens (8am) to be in with a chance of buying anything. ‘Rimping’ is the place to go for Western foods. There are many of them around Chiang Mai – most shopping malls have them and there are also a few other stores dotted around. They’re the most expensive grocery store in Chiang Mai. However, it’s worth it to know you can buy things like yoghurt, bread, decaf coffee (for £7 a bag!) and Lindt chocolate. There’s also a big Tesco (Tesco Lotus) which has an unbelievable selection of things. It’s like a shopping mall in itself – around the Tesco there are lots of smaller stores, markets and restaurants. The Tesco Lotus has groceries, clothes, appliances, homewares, toys and probably lots more that we didn’t get to. Outside Tesco Lotus you can find the Chiang Mai flower market, which is a huge market full of flowers, plants and herbs. We are planning to be brave and go to Thai supermarkets and shops, but it’s comforting to know that there are ‘easy’ options if we need them! There are also a couple of other supermarket options – Big C and Tops, both of which are a little cheaper than the Rimping but won’t necessarily have the selection of Western products.